Yogi Berra put it well, "You don't have to swing hard to hit a home run. If you got the timing, it'll go". Those words can also be applied to real estate, golf and asking a girl to Prom. 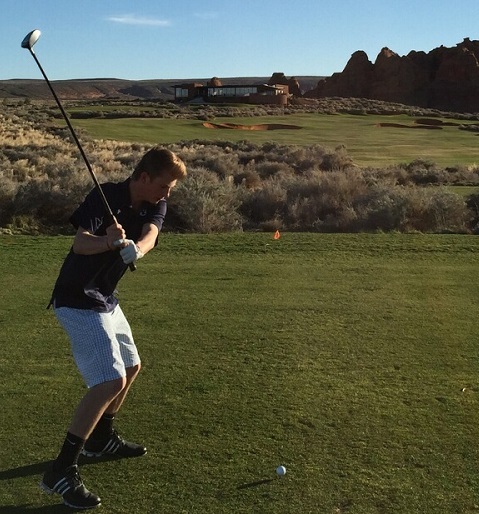 Park City High School Senior, star basketball player and not too shabby golfer, Logan Holbrook, has the right idea about all three. It's all about timing. From the tee box in this photo, Logan confidently hit eight golf balls into the back yard of the girl he asked to Prom - May I Take You To Prom From Logan - one word on each ball. His timing was perfect. Of course, his Realtor found the right house. The timing for golf properties at Jeremy Ranch, Victory Ranch, Glenwild, Park Meadows, Red Ledges and Promontory is perfect. The number of new construction starts for luxury custom homes is still increasing. I spoke to one excavator, who has more than 50 holes to dig. All are in one of the superior private golf communities located in the Park City/Deer Valley area. For the first time in quite a few years, on June 20th, Promontory will be holding a launch for new developer lots. The prices will be between $560,000 and just over $1mm. Along with the Nicklaus Hillside Village model homes, the Grand Opening of the Nicklaus Painted Valley clubhouse will be held. This is one of those opportunities that not only will a buyer need to time perfectly, they will need to have all the relevant information, as well. Logan had the timing. How did he find the right location? Promontory is a superbly planned community that has been approved for almost 1,900 units. What's new? What's the best of the new? What are all the nuances associated with a developer launch? What Promontory product may fit your needs just as well, if not better? Which Private Golf Community is the best fit for your particular lifestyle? How do you get all Luxury Golf Community information? Which Realtors know all the golf product in the Park City area? Who has the information that is most valuable to you? Posted in Uncategorized, Golf News | 0 Responses to "It's all about Timing - Real Estate, Golf & Prom"